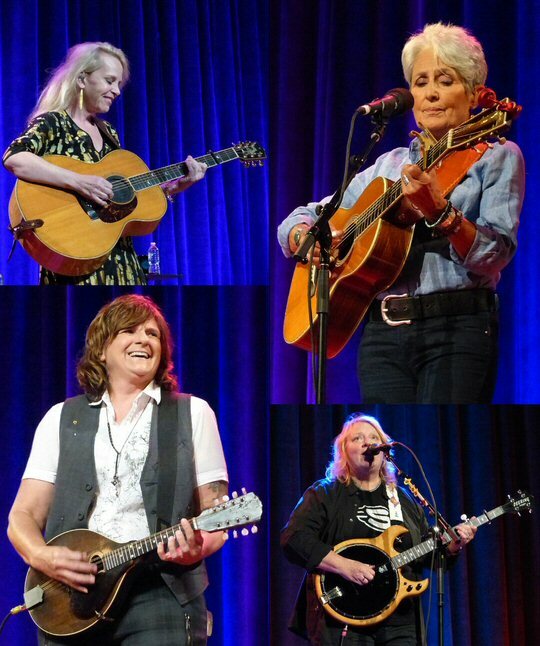 It was twenty-five years ago when Joan invited the Indigo Girls to perform at a 1991 benefit for Baez's human rights organization Humanitas. The Girls in turn suggested that Mary join them. Since then they have remained friends and have occasionally performed together but it was not until they were celebrating Joan's 75th birthday at the Beacon Theater in NYC that the idea of touring together became a reality. The Ryman pews were packed but the stage was almost empty as this was an acoustic concert so only a few amps and mics were needed. But, don't be deceived Four Voices delivered a powerful show. As the lights dimmed the crowd cheered giving the ladies a warm welcome. Joan took the lead on "Don't Think Twice, It's All Right" as the others added fine backing vocals to the Bob Dylan classic. 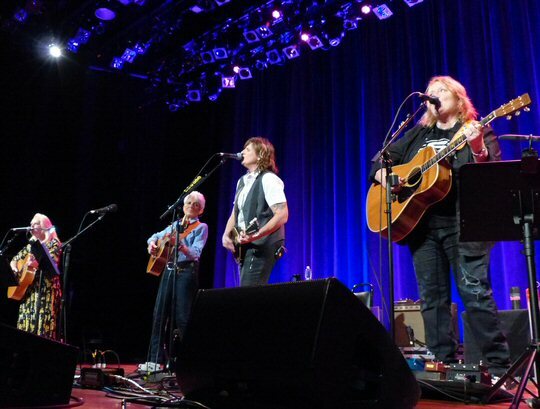 Next, the Indigo Girls aptly handled their tune "Get Out The Map". As the evening unfolded political commentary was woven into the set list. Woody Guthrie's "Deportee" was just as relevant today as when the infamous folk singer wrote it many years ago. "I was never an optimist," declared Baez before she presented a solo version of "Another World" (Antony and the Johnsons). Joan gently tapped her guitar for rhythm but allowed the lyrics to be the main focus. The others joined her with another call for a better world with "Let It Be Me" a song Amy said she wrote a few administrations ago but "here we are again" she mused. Little by little the ladies were making their statement. In search of a different type of peace Mary alone sang "I Have A Need For Solitude". As she finished a fan shouted out "it was lovely". Another said "looking good, Joan" who was looking fashionable and trim in denim. "Wrote this one after the Virginia Tech shootings," stated Amy before presenting "Who Sold The Gun" another tune reflecting the times and their reactions to it. Joan shined brightly on "Diamonds and Rust" as Mary did on "The Age of Miracles". "Shame On You" sounded even better with Four Voices. Emily mentioned that she is releasing her first solo album this year so she shared a new song "Train Inside" about a dysfunctional relationship peppered with train references. "Simply gorgeous," exclaimed Joan as Saliers finished. The biggest statement of the night came from Baez. "Nasty Man" was a caustic and comical commentary about the current Commander in Chief. The song earned Joan a standing ovation but apparently not a tweet from you know who. Tom Waits' "The Last Leaf on the Tree" was also a powerful moment as was Four Voices' potent encore featuring Dylan's timeless "The Times They Are A-Changin" and The Band's "The Night They Drove Old Dixie Down". The audience wanted more but the ladies perhaps surprised by the rowdy response apologized stating "that's all we rehearsed" but there really was no need to be sorry as Four Voices presented a stellar statement of a show but perhaps they can work out "Galileo" for future dates to really leave their fans star-struck and speechless.